Hiring a classic car makes your special day even more memorable! A classic car is an imaginative and distinctive alternative for your wedding car hire. Classic cars are very photogenic and unusual compared to a more traditional white Rolls Royce wedding car. 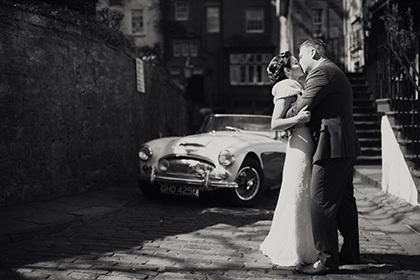 Why not arrange, as part of your wedding transport, for the father of the bride to drive the bride to church in a stylish and unique classic car? The groom could also say goodbye to bachelorhood from the driving seat of a classic sports car such as an E-Type Jaguar or Triumph Stag. This would also make a great gift to a future husband from the bride. Later, the groom could also whisk his blushing bride away on honeymoon in an eye-catching classic car. The range of classic car wedding hires available with HCHG is distinctive and orginal. All members have many years of experience in attending to the details involved in wedding car hire. Chauffeurs can be arranged and members can also accommodate almost every special request.